The exchange preceded by three months the blockbuster disclosure by former NSA contractor Edward Snowden that the agency, indeed, had extensive, classified electronic surveillance of telephone and e-mail records. Clapper said he confused NSA programs when answering Wyden, saying he only realized later that the Oregon Democrat was referring to the telephone surveillance program aimed at overseas communication to and from the United States. "I have thought long and hard to re-create what went through my mind at the time," he said, adding that "my response was clearly erroneous - for which I apologize," Clapper said. Clapper says he was faced with trying to answer a question about a program that at the time was still classified. He also thought, he said, that Wyden was talking about the collection of phone call content rather than metadata. Clapper said he wrote the letter to the committee "because of the charged rhetoric and heated controversy" after he responded to Wyden's question. Clapper said he sought to privately correct his answer to the committee but also sought to write a public letter. "I can now openly correct it because the existence of the metadata collection program has been declassified," he said. Tom Caiazza, a spokesman for Wyden, said Clapper's office acknowledged soon after the March hearing that his statement was inaccurate "but refused to correct the public record when given the opportunity." Caiazza said Wyden's staff told Clapper's office "that this was a serious concern" and the lawmaker "continued to raise concerns about the government's reliance on secret law in the weeks following the hearing." "Senator Wyden is deeply troubled by a number of misleading statements senior officials have made about domestic surveillance in the past several years. He will continue pushing for an open and honest debate about programs and laws that touch on the personal lives of ordinary Americans," Caiazza said. No doubt Clapper understood his statement when he said it. Anyway, Clapper firmly represents the spy mentality overtaking America today and thus is a threat to the freedom which he supposedly defends. 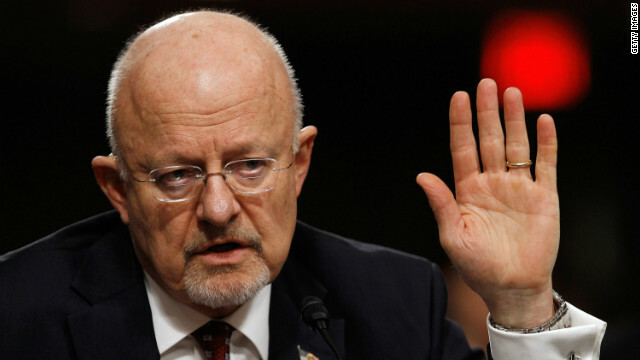 I have heard Clapper's statements and they border on the profoundly ridiculous. So many liars work for Obama. Not a decent bone in his body. Seems to me when you labor to use this phrase "not wittingly" as if to suggest any collection is unintended is a bot more than "erroneous" but blatant deception...ergo "terminate employment AND accept his apology". To say one gave erroneous testimony sounds a bit better than to say one gave false testimony. Well done. Where's the probitive, investigative journalism on this scandal? I'm so confused. Is it true the AG was not providing congress with Fisa Court rulings? Are there any " honest " people in our government ? Why aren't Republicans screaming for Clapper's head? Look at the Committees that Sen. Ron Wyden serves on. There is no way he didn't know about the data collection. They were all just trying to keep a very expensive anti-terrorist tool from going down the drain. I can not believe this man is still " IN ". He mislead our elected official, he should be removed from office at once and tried for purjery. Democrats arn't doing much better we need to junk the whole lot of them and create new governing bodies the way Jefferson said we should – when our government stops serving "The People" Throw the bums out ! Why is it that when a Republican makes a mistake it"s automatically "lying", but when a Democrat does it, the Obama loving media calls it "erroneous"? No matter which party, a lie is a lie, and perjury is perjury. Why didn't all the people who have been convicted og perjury just later "apologize" for it, not be tried, keep theri cushy job and elite status, and indeed suffer no consequenses from ANYONE. Even the press still laps up his Nationa Security drivel. It is time to dismantle all the anti-democratic elements in the US government, starting with the NSA, and the the CIA. Like the Cold War is still going on and we need these lying agencies.. for what? To lie to the pepople and spy on the people and run some illegal secret government with secret courts and cesret laws and other4 crap that has no place in a democratic society. Guy lies knowingly and purposefully to Congress. 2. What are the legal ramifications? 3. What is going on in this country!? Lol, I know you guys don't like to let facts get in the way of your bashing of the other party, but it should be noted that Clapper was brought into the Intelligence field by Bush and spent more time serving under a Republican Admin than Dems. Also, the senator checking him is a Dem, not a Republican. When a Republican does it, it's lying. When a Democrat does it, it's "erroneous". LMFAO! All Politicians are becoming worthless nowadays, I hate to even vote anymore you have to pick which is less worthless. Telling the truth just isn't there no more. Don't fall for the 'vote for the lesser of two evils" line, there are more options than Red or Blue, the fact that they keep telling you otherwise should be a dead give-away that you are being manipulated. They were all lying. Both the question and the answer were design to head off rumors. But then Snowden leaked. And the President tried to calm fears by pointing out all three branches have had over sight. A Congressman won't ask a question about a classified program in an open to the public hearing without knowing the answer ahead of time – of course this just my opinion. Me too. I will miss my "FA." The question was very broad, "any data...millions of Americans" either Clapper as the agency head is incompetent or he outright lied. I don't see any middle ground for a grey area of misunderstanding. So,that is it? He apologizes, and get a free pass? Would that be acceptable for me, If I ever have to do this, and lie? Oops, sorry about that! No, I think they would hold me accountable to the Law. Just not any of these bozos. I trust none of them. I am a Independent, so I can dislike both parties equally. An obamanista who actually apologizes for lying? Is this a sign of the apocalypse? I'm willing to bet this guy won't get invited on Obama's next100 million dollar road trip. BTW: How will the "first family" be celebrating the 4th of July?" Claptrap is lying because that's what the Obama administration tells its people to do. The question asked, "is there ANY TYPE OF DATA"? Kind of covers a lot. The only thing worst than a totalitarian government is a totalitarian government that knows your every move. So by the conservative logic I'm seeing applied here, every person who's ever given an erroneous answer to a question on accident, is a liar. Every one. No possible exceptions. First off I am anything but a conservative or Republican, so please avoid generalities. The fact is he outwardly lied in a sworn oath to a formal committee. No one forced his disclosure it was given freely. If you can not insist on our politicians to speak the truth while under oath then you might as well not have then speak under oath. Accountability regardless of political beliefs is what makes our form of government work. This is the reason Americans of both parties have so little faith in our congress. Please be reminded that the program was classified at the time. Therefore, Director Clapper could not disclose its existence. According to the article, Mr. Clapper did correct the record privately shortly after his testimony, but with reason would not correct the public record. It was up to Senator Wyden and the members of the Senate Committee to take the next step of public disclosure if they thought the inaccuracy was so egregious. This dust-up with Director Clapper is another one of those red herring publicity stunts that amount to nothing. Why yes – every person who's ever given an erroneous answer to a question on accident, is a liar, when you have sworn an oath to tell the truth, and you are the intelligence chief of the United States of America, in front of Congress. If you did not know the answer, or "could not disclose" the answer – plead the fifth. If you say no, and then after a scandal, change your answer, then that is in fact, a bold-faced lie. Any more questions I could clear up for you? Is it also a lie to not disclose the fact someone's lying? Congress had oversight on these NSA programs – they had to know – at least a few members – funding didn't just drop out of the sky. Clapper should apologize for giving a contractor that level of security access after only 3 months on the job. Who cares about Snowden, there are lots of Snowden's waiting in the wings to be bribed after this fiasco. How far will you go to justify the actions of someone affiliated with your political party? This is an obvious lie, to try and justify this as erroneous is a joke. No I am not a Republican and do not vote Republican. Another Obama megaphone getting caught in the act! And as to congress defending these lies, it's because they have made themselves exempt from NSA spying. Congress put a provision in the law that says that THEIR conversations and emails can NOT be stored, not even for future retrieval. The politicians don't want THEIR communications stored, but they are happy to have OUR communications stored and searched. BTW, what could be more dangerous that an Washington insider politician in congress communicating with a terrorist? It seems to me that such a problem could be exponentially more dangerous. Subtext: "Sorry, I got caught." Lying to Congress is a felony. Why hasn't this person be charged? Because we now have a government that gets to cherry pick laws and to whom they apply. Just look who's the Attorney General. That answers your question. Because if the law was rightly enforced, lots of people in Washington would be behind bars! We wouldn't want that, would we now! How can Clapper misunderstand the meaning of "ANY" when asked whether the National Security Agency (NSA) collected "any type of data at all on millions or hundreds of millions of Americans?" And...his reply is "NO SIR"
His apology for giving "erroneous testimony" (Just another way to say lie) should have also included his resignation. So he is admitting to PURGERY by giving false or lies to an investigative branch of the government. So, why is he not behind bars where he belongs? Apologize for being a liar? Don't believe so. One confesses to being a liar, one could also express regret for being a liar. An Apology for being a liar does not wash. Clinton was smarter, instead of apologizing for what he did, he said what he did was not right. CNN – why isn't there a story on the frontpage about Clapper? What a shock! More lying from the Obama administration. Obama and his liberals need to go! It is a knee-clapper! The question moved from dossiers to any type of data. Dossiers have a specific meaning. They are detailed records of a person. Could be their employment history, criminal history, living history, etc. I believe the NSA chief's answer that they don't have "dossiers" on hundreds of millions of people is still correct. Phone metadata are not dossiers. Read it again. The question was "ANY TYPE OF DATA". The Head Nazi apologizes for lying. But isn't lying the first duty of a Nazi? Hopefully he'll be assassinated along with Obama. watch your words for for they become actions. what we think we become . He LIED under oath. He must be prosecuted. FACT: Every government in history has turned against the citizens they swore to protect. Welcome to the New World Order! Think more... follow less! Deserves a loud collective clap for admitting the truth :). maybe the tide is turning – this is the first administration official that has admitted lying – wait – he use the term "clearly erroneous", that's the problem with politicians – they think they have a different standard. Apparently POTUS just found out from MSM that he has liars in his administration, oh dear. If I lied to my supervisor I can tell you I'd get more than a slap on the wrist. He didn't speak erroneously – the question was crystal clear – "any data" means just that, ANY DATA. He lied – and for those that can read body language you could tell he was lying. Worst "tell" in history. With the Obama administration, will there ever, ever be an end to the lies and deceit? My guess is that the answer is a resounding "NO"! But, América can only hope. NO?! Considering we had 8 years of lies and deceit from Bush, I don't see how you can now complain when the current guy does the same thing. Blame Bush, Blame Bush, Blame Bush. I wish we could get something of value from you. Still living in the past, like 8 years ago? How long are you going to use that line? All traitors, including the GOP should be shot. The thing is, the NSA work does NOT touch the personal lives of ordinary Americans. I am one, and I could care if somewhere there is a record of the phone numbers I have called. The calls are all legit; there is nothing of interest there; records on me are a waste of space. So what? Not one person is ever going to find a use for that information. By the way I 've lived in Africa and right now I've been living in China-there is still nothing I fear somebody will find out from phone records that could be used against me. What is the big freakin' deal here? John, the flip side of this argument is if there is nothing of interest, why do they need to review the information? If someone is a suspect, go through the proper channels to review the information. So what happens when someone the government has labeled a terrorist calls you? Either by accident or by design? Now, you're listed as a terrorist contact. Maybe if you get those calls a lot, you get the terrorist label, too. There's a lot to worry about here. Whey does he have to apologize when he was following Obama's orders? Obama has already picked the laws he want to enforce and those he wants to ignore and to be scrutinized by others is unacceptable. Obama does in his own words have a mandate to "do things my way". Where's your proof that it is a lie? He does pick and choose which laws need to be enforced. wow nice comeback. I think the teacher has called you back from recess. I have a difficult time believing there are this many people who think lying, deception, telling untruths, or whatever you want to call it began with this administration. You have Republican members of Congress who flat out lie on the floor of Congress, and when they are called on it, respond that what they said "was not intended to be a factual statement." However, what I find most hilarious about this whole situation is that Obama is accused of acting like a Republican. The possible prosecution of journalists is described by Republicans as "absolutely Nixonian." And we haven't seen such behavior towards the American people "since McCarthy." When Republicans start to behave better than Democrats, they can criticize Democrats (and vice versa). Myself and, I'm certain others in this forum, know for a fact deception, lying. etc. did not begin with this "administration. It is not my concern where it began....................my concern is that (sadly) it is alive and well now. Previous lying and deception beginning with the various political parties do not provide an excuse for that is happening now. Let's clean it up. As an American citizen, I have the right, and a duty to call out liars and lawbreakers that are supposed to be serving the taxpayer (all three of us). And I really don't care about their political leanings, either. I like when they expand on the little truths to make themselves look good but when the whole truth is out it looks bad. This I cant even describe! it's bush's fault, it's bush's fault, it's bush's fault. Gee mom – I knew it was wrong but all the other kids were doing it – so I just did it too. The reason people "Blame Bush" as so many Republicans like to chant, is that in a two party system, demanding that an administration be ousted means, by default, that you are advocating for the other party to be in power, which would be no better. The only way this country is ever going to get out of this downward spiral of corruption and abuse of power is to break the two party system. he's acting like a life long career... criminal, like they all are, red or blue. Get over the colors, because that's what is blinding you. I fully understand now. If I commit murder I can be absolved because of "erroneous (?) behavior." They can't fire him – he knows where all the bodies are buried. In the real world (outside of Washington DC), giving "erroneous testimony" is called LYING. And sometimes called PERJURY! The paragrafs of sentences to holding teck co like my self – in servalence senerio when i say get up and get over her -and servalece is looking at you then you say back to the observer – my lawyer said i dont have to do what you tell me – as ease dropping in to criminal welfsre applications for platation robbery or marradge – the sever punishments from space tools can be harmfull – and further more the pre recorded lawyer saying your emancipated just ignore the owner of the plantaion and go kis kim and act like you own hawie _the battery loss of arguing then besomes reclaimed to tourcher with tools – the phcology dpartment using halph tools as criminal is criminal and police trust theriors of riots and religion ranks are same as a fleing fellon hore on a plantation in the movie planet of the apes – ! you criminal dreesed like a police man or woman backtalking with a post office id means absolutly nothing in planet of the apes records of plantaion masters – and a wast of time is another listed crime – all in computer resposices in phones or in person – the out rageous opposition as being wiped is not a trigger you can court fee out of or talk out of when you mess with boss – ! A perfect example of the government run Department of Education. He committed perjury and probably should be a felon. He should just resign since I don't think throwing him in jail will do much good. People don't want to hear his lame excuses. If Congress lets him completely off the hook then it will set a bad legal precedent. It is obvious that these secret courts have failed. The Chief Justice of the Supreme Court should also be resigning. See, the thing is, that's the culture in intelligence services. I've worked with intel for many years before I retired, and that's the reason I retired. I was disgusted by what I saw. The deceitfulness, the righteous indignation...then the half hearted apology. That's also the reason Snowden is being pursued so vehemently. Not to secure him, that milk is already spilled. No, it's to frighten others who might be considering the same actions. I didn't expect this. This guy has outstanding character. This is a guy I can work for without question. How can a Head of a Federal Agency publicly admits about lying on huge national intelligence debacle , and does not resign from his post ? Please leave . Oh I'm sorry. Now go off and play with yourselves and I'll keep doing what you caught me doing. Who's giving him a pass? However, when I worked imagery and we had to create new imagery of a bomb range on US soil, we had to jump through major hoops. There IS oversight, but it is failing. I've been very concerned about the integrity of the Obama administration. However James Clapper was put in an awkward situation. Didn't most of the senators already know about the NSA's activities? Didn't they know it was classified? Maybe he could have handled it better. But he's one of the few to admit to making a mistake. oh my God, he was put in an awkard situation? He's the director of THE NSA for crying out loud. Why did he let a contractor with 3 months on the job have access to that level of security?????? Yep. This guy, is a lying sack of S. He willingly, knowingly lied to the Senate and the nation. Thank you Mr. Snowden. This administration thinks it is a standard practice to lie, even to Congress. Clapper should bbe convicted of lying before Congress and serve time! And he shouldnt be the only one. obama himself told the people that PRISM wasnt recording and collecting data from eeveryone, then later we found out that his statement wasnt correct. obama should be giving Clapper company smashing large rocks into smaller ones! LIberals were reworded to be "progressives." Are liars now to be reworded as those who give "erroneous testimony?" Q.: How can you tell when NObama is lying? A.: His lips are moving. So Obama is that bald white guy? Under the table he might as well be up clappers backside to his elbow running like a puppet. A lie by any other name is a lie; and no matter how often an administration official "apologies" it is still a lie. Clapper... we have footage of you giving this testimony. You're sweating, looking away, touching your head nervously and giving long, awkward pauses in your answers - especially to this question. This wasn't "an error," it was "a lie." You have _literally_ every 'tell' in the book... you knew the answer you were giving was untruthful. If we prosecute Snowden we should prosecute Clapper. It's only fair. The real issue is no one is ever punished for lying.......lie about this, lie about that.......no one is held accountable, not the IRS idiots, the Benghazi cover up squad, Holder, Clapper, Rice, Carney.........NO ONE.........I grew up at a time when people were held accountable, when telling lies had their consequences........not today though.....today you can virtually make up the story and get away with it.........that simply represents a lack of moral responsibility that no society can sustain...........I feel for the generations to come if the liberals continue to get their way...........Thanks Barack!! Wrong thread. We're not talking about Bush here. The stench of hypocrisy is strong with this one. Nope that's the order coming out of the current admin. How's that CHANGE working out for ya? Remember Colin Powell? He lied to the UN, as a spokesman for the Bush Administration, and got caught. The only thing that happened to him was he resigned, by personal choice. His lie forced us into a trillion dollar war that had to be cleaned up by the current administration. So, once you're all done bashing the current administration, keep in mind that you must also bash the previous administration for starting the programs. This is nothing more than political theater on both sides. One party orcastrates a controversy for the other party, then catches them once they are in power. Just wait and see what messes are left for the next republician president to clean up. Then remember how harshly you judged this administration, and see if the same happens to your President. You will be doing what Obama supporters are doing now, crying foul and blaming the last administration for your current woes. @usmc1371,that's what yah get for hiring an ex Bush employee right,liars abound there..And remember he was an executive at Booz when Snowden was hired as well..So marine does two wrongs make a right not in this situation,never does with tainted goods right! !And there's never going to be much change until your present screwups in republican reps get off their asses, quit holding Americans hostage and help pass some legislation in jobs,infastructure bills with democrates to get America out of this mess,right or areyou in denile about what's going on in congress as well!! @Necron99,you say Pres.Obama but remember bud it all started under your hero Bushs! !PatriotAct,Homeland Security,NSA,CIA and you don't think its been going on longer maybe than you've been around ,get a life and read ! !Wouldn't hurt acting a bit intelligent once in a while with facts instead of useless rantings either! !Typical ignorent,racist republicans the real cancer of our country not these intrusive programs you whine about or liars like Issa you can't stand with because he mirrors your imagine!! @Sambo,so you're just learning presidents spy on their own and just where the hell have you been the North Pole,moon,not here right! !Nixon had tapped Ted Kennedys office during his presidency and put him on his hit list because Nixon was scared Ted would wipe him up at election time..Nothing new bud just the names have changed that's all! !